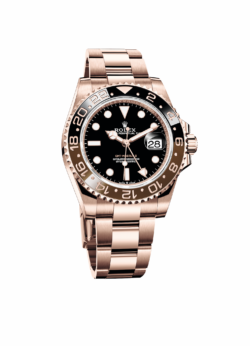 Rolex delighted its fans with the Rolex Oyster Perpetual GMT-Master II, which indicates time in two zones. 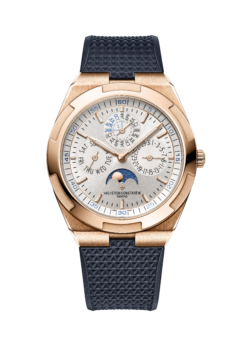 The 40mm watch carries the COSC certification and, after casing, the entire watch is further tested to receive the Rolex Superlative Chronometer certification. Offering the date in addition to hours, minutes and seconds, the GMT-Master II features a rotatable 24-hour graduated bezel (made with Rolex’s proprietary scratchproof Cerachrom inserts), and a separate GMT hand for setting a second time zone. This is independently set, and has a stop-seconds function for ultimate precision. Caliber 3285 is equipped with a bidirectional perpetual rotor accurate to -2/+2 seconds per day. 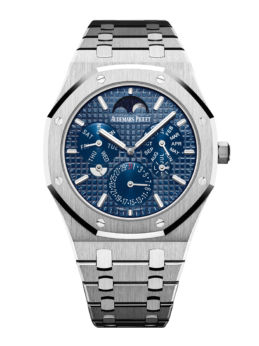 Elegantly crafted in Rolex’s proprietary Everose gold with a matching Everose Oyster bracelet, the watch boasts a black lacquer dial with Chromalight hands and hour markers that glow blue in the dark. Rolex equips the watch with a Triplock winding crown and a patented system that makes it water resistant to 100 meters.